This post is an entry for BritMums ‘What’s for Dinner Tonight?’ sponsored by Schwartz. Find out more about the new 2in1 mixes here. We always enjoy a roast dinner at the weekend but when you have a young family and lots of demands on your time it is often difficult to find the time. 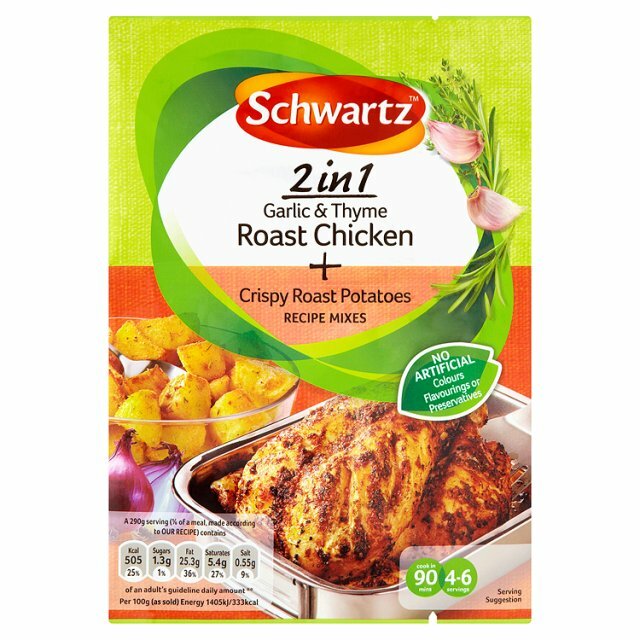 We've had so many busy weekends recently that, when Britmums and Schwartz teamed up to send some samples of their brand new 2in1 mixes out I was really pleased to see a sachet to make Garlic and Thyme Roast Chicken and Crispy Roast Potatoes. I just fancied a roast dinner so this was the perfect opportunity to try out the range and enjoy an indulgent mid-week dinner. The Schwartz 2in1 range is a new addition to their range of their recipe mixes. It features five products and what sets them aside is that, in addition to seasoning for the main ingredient of the meal, it also offers a mix to add an accompaniment to it. So you have Chicken Tikka with Mint and Cucumber Raita, Garlic and Herb Crunchy Chicken Bites with Cheese and Chive Dip, Garlic and Thyme Roast Chicken with Crispy Roasted Potatoes, Mediteranean Chicken Pasta with Cheesey Crumb Topping and Southern Style Crunchy Chicken Bites with BBQ Dip. The on pack instructions are clear and easy to follow, telling you when to use each sachet. In fact, if you follow the instructions exactly, as I did, then you will be able to structure the preparation and cooking easily. It's great for a less confident cook as it talks you through every step. All you need to add is your choice of cooking oil. We were really impressed by the flavour of the chicken and potatoes, and with how easy it was to put the meal together. I'll definitely use these again and we are looking forward to trying the Mediteranean Chicken Pasta with Cheesey Crumb Topping too.